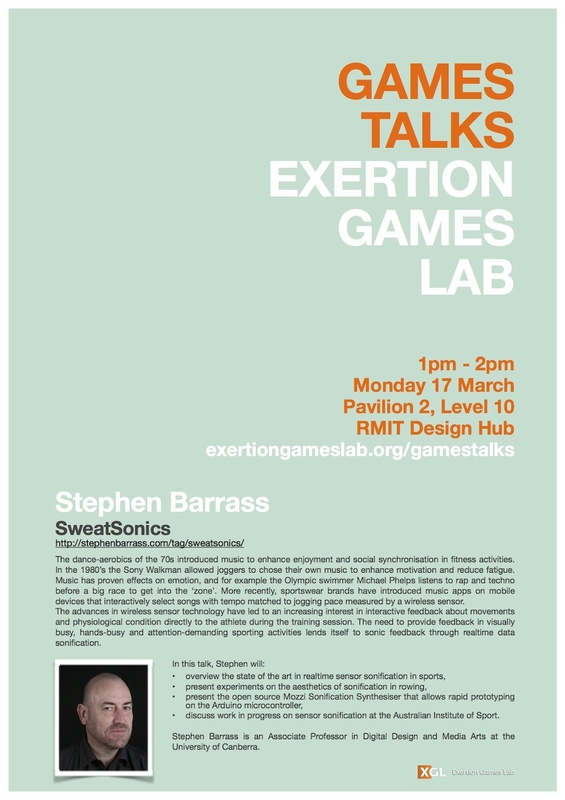 You are invited to attend this talk hosted by the Exertion Games Lab entitled “SweatSonics” by Stephen Barrass. Stephen will be visiting us in the lab from 17 – 24 March. When: Monday 17 March 2014, 1:00pm – 2:00pm. The dance-aerobics of the 70s introduced music to enhance enjoyment and social synchronisation in fitness activities. In the 1980’s the Sony Walkman allowed joggers to chose their own music to enhance motivation and reduce fatigue. Music has proven effects on emotion, and for example the Olympic swimmer Michael Phelps listens to rap and techno before a big race to get into the ‘zone’. More recently, sportswear brands have introduced music apps on mobile devices that interactively select songs with tempo matched to jogging pace measured by a wireless sensor. The advances in wireless sensor technology have led to an increasing interest in interactive feedback about movements and physiological condition directly to the athlete during the training session. The need to provide feedback in visually busy, hands-busy and attention-demanding sporting activities lends itself to sonic feedback through realtime data sonification. discuss work in progress on sensor sonification at the Australian Institute of Sport.